The farther south you go in Chile, the more rugged and beautiful the terrain. 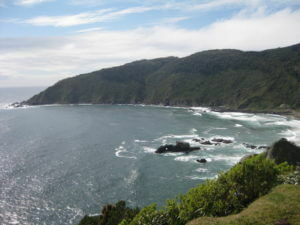 The coastline is no exception and offers some amazing views and beaches. The Pilolcura beach near Valdivia, southern Chile, offers a very picturesque destination if you’re up for the adventure of getting there. 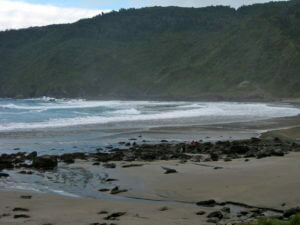 The secluded Pilolcura beach is situated just west of Valdivia, Chile. The only way to get to the beach is via a very rough dirt and gravel road that winds you up a coastal mountain range and plops you down on the other side. You’ll definitely want a 4×4 vehicle if you intend to visit this beach. Due to the nature of the road, it will take you about an hour to get to the beach from Valdivia. There are plenty of blind curves, meandering cows, and even large construction vehicles, so drive carefully. The road down to the beach offers a breathtaking panorama of rock formations and a widely curved beach. 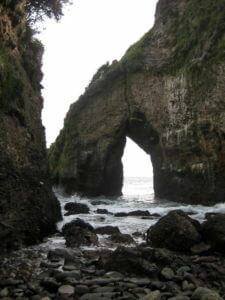 You’ll find some very interesting rock formations that have been carved out by the waves to form arches. Some of the large rocks house the nests of hundreds of sea birds. While the views are amazing, the water is dangerous and people have drowned while swimming near these rocks. You won’t find any permanent stores, restaurants, or facilities on the beach. During the summer months, there are vendors who will set up temporarily to sell you food and other beach wares. If you plan to visit in the off-season, make sure to carry your own food in and use a restroom before you leave. Thank you for the beautiful photos of Pilolcura beach. How could see more of the beach? Also, is it possible to see photos of the Fort where Lord Cochrane first landed? My parents were from Chile and I want to do a tour of this area. Gracias.